I treated myself to some jelly beans today. 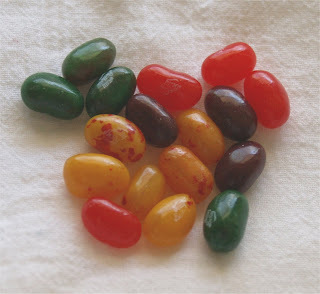 Especially when they are Jelly Belly jelly beans, Oh Yum! Why did I need a treat?! So, I left her office with a clean bill of health and some various items to try to help me get a grasp on my headaches. We needed some fruit so I stopped in the grocery store. While shopping, I noticed this great little stand of jelly beans. Who can resist a jelly bean? I certainly can’t resist their sweet call. You can try all you want but those fun colors and the taste that you will be greeted with when you chew one. I knew that this was a good teat for me and not too many calories. Hum.. what was I in the mood for? I decided on Strawberry, Watermelon, Peach and Dr. Pepper. I had never had the peach flavored ones and I was treated to a wonderful surprise. Those peach little gems are outstanding. Needless to say, I was a happy camper today between the doctor visit and my jelly beans.